Guess what!? This week I have my very first guest poster over here at the Whole Smiths. If you’ve been following me over on Instagram (you can do it HERE), you know that I’ve been working on a super-secret, super-duper cool project. While I can’t yet tell you what it is (it’s a secret, remember? ), I can tell you it will be worth the wait. I promise. And because I’m spending every waking hour busting my hump to get it done for you, I’ve have lined up some really amazing guest posters and recipes to help me out over here in blog world. 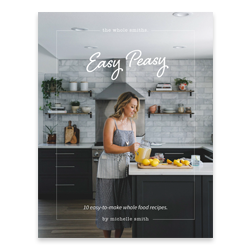 My first guest blogger is someone who I am blessed to call a friend, Kristen from Living, Loving Paleo. If you aren’t already following her blog or Instagram, it’s a must. Not only is she funny, sweet and kind she’s a total badass. Like, I want to be her when I grow up. Over at Living, Loving Paleo she shares about her battle and ultimate triumph with Crohn’s disease and her adventures training to be a covert, ninja spy. Ok, maybe she’s not actually a ninja spy but she should be because she knows how to do amazing ninja things that I can only dream of at this point. 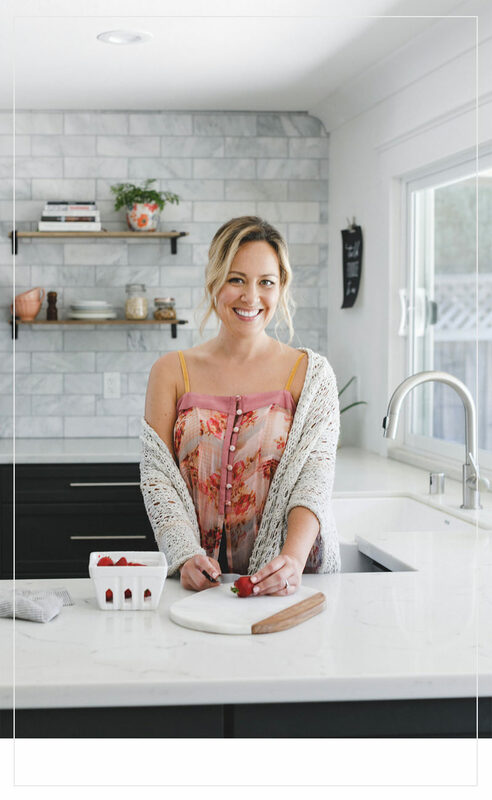 In short, I adore her and Kristen is truly one of my favorite parts of this whole blogging, paleo adventure I’ve been on. So Kristen, thank you for always being a sounding board, inspiration and all around amazing person in my life. You are truly one of the greatest co-workers (?) and friends a girl could ask for. Have you ever met someone that you just instantly connected with? That was exactly how I felt when I first met Michelle, the brilliant creator of this website! Over the years she’s become such a good friend that I’m so fortunate to have in my life. You can trust that she’s just as amazing in real life as you all think she is! 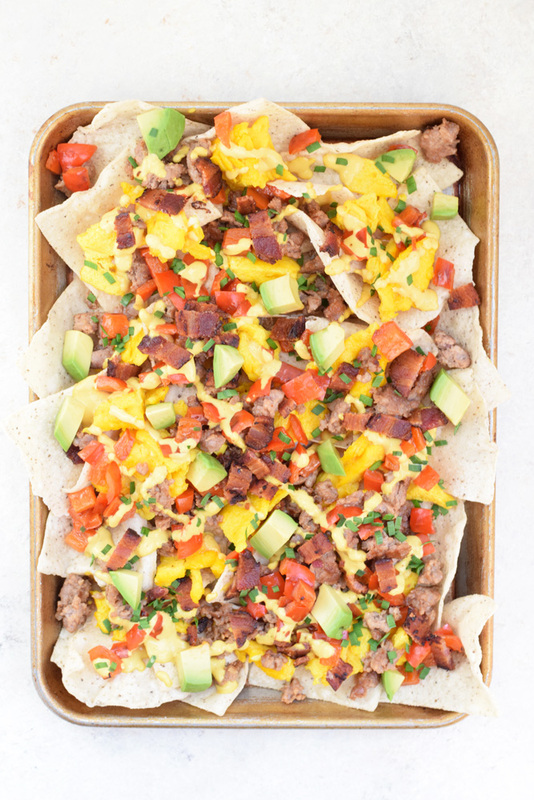 Even more amazing than these Breakfast Nachos, and THAT’S saying a lot, cause these are gooooood! I mean, you guys, I recently found out that she’s as big of a fan as the TV show Hey Dude as I am…what’s not to love?! Do you remember that show? It was the BEST. Anyway, I guess we’re here to talk food…yeah? Food is pretty much my favorite subject, and I’m so stoked to be guest posting here today! 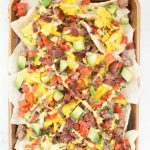 These breakfast nachos are such a fun way to switch up your typical breakfast, and would be awesome to make for a big brunch with friends! 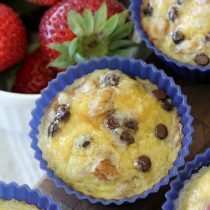 Your friends will LOVE you if you make these for them. 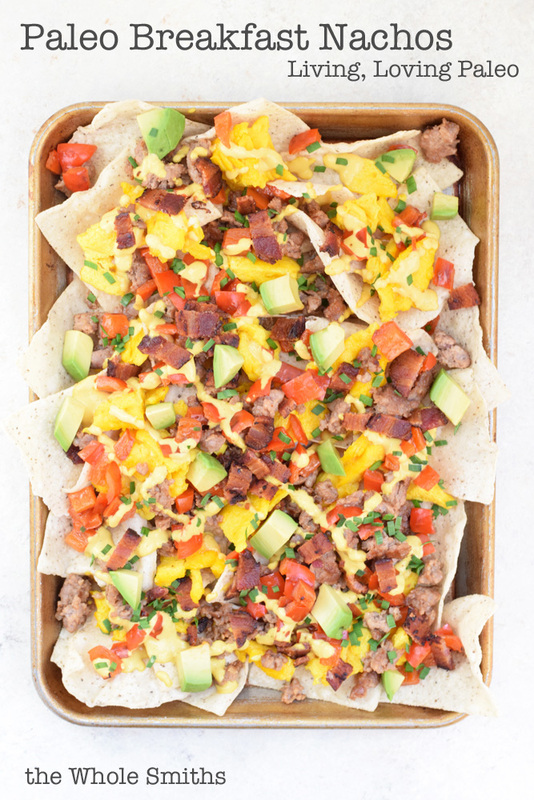 I mean, can you imagine going to someone’s house for brunch and they made you breakfast nachos? Who doesn’t love brunch? And nachos?! 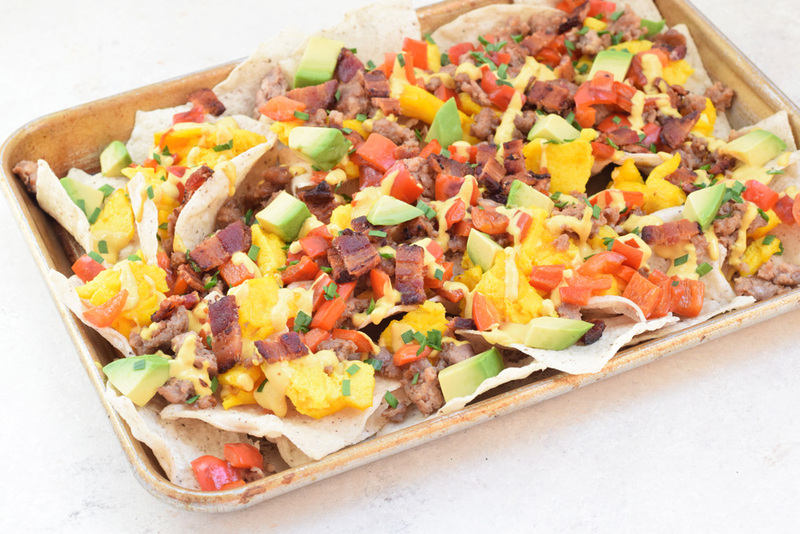 I used my favorite grain-free tortilla chips to make these breakfast nachos, but you can just as easily use plantain chips, or any chips that you love. The “cheese” sauce is so legit that you’ll never guess that it’s completely dairy-free! Plus it’s a breeze to make, so there’s that. 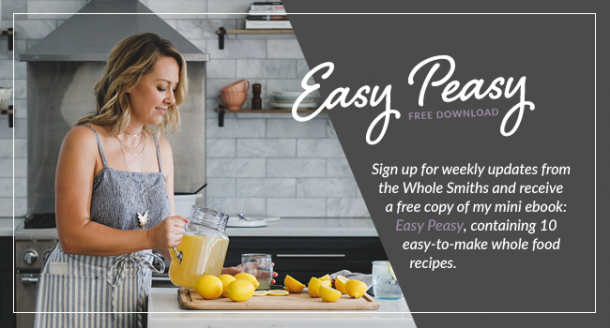 Everyone loves easy – that’s a FACT. 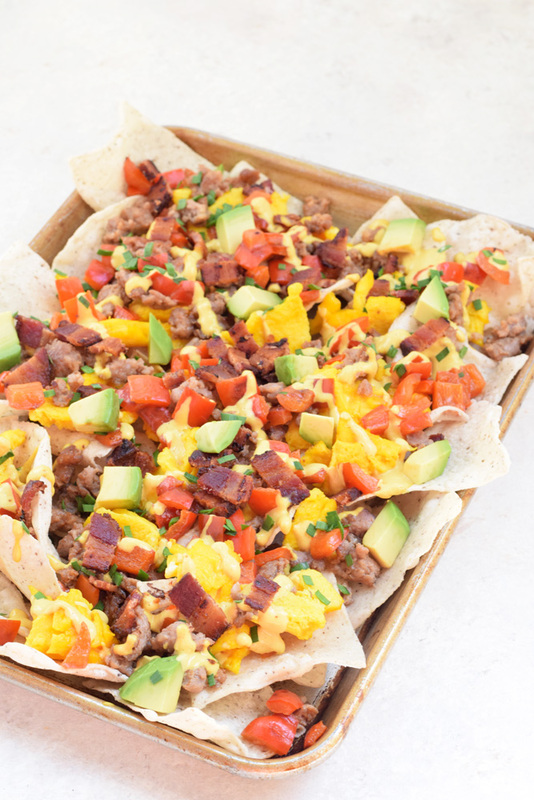 Enjoy this recipe for these Breakfast Nachos! 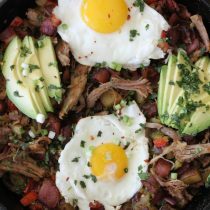 An easy-to-make breakfast that's paleo friendly and gluten-free. Perfect for brunch get togethers or any given Wednesday morning. A MUST MAKE! Place the cashews into a clean bowl. Bring a small pot of water to a boil, and then pour the water over the cashews to soak. The cashews should be fully immersed in the water. Set aside. Heat a large pan over medium heat. Cook the bacon until crispy, and then place on a plate lined with paper towels. Crumble the bacon once it’s cool enough to handle. Add the diced/crumbled sausage to the pan and sauté until cooked through. Place the sausage into a clean bowl and set aside. Add the bell pepper to the pan and sauté until softened. Place the bell pepper into the bowl with the sausage. Reduce the heat to medium-low. Drain the fat from the pan, leaving 1 tablespoon to cook the eggs. 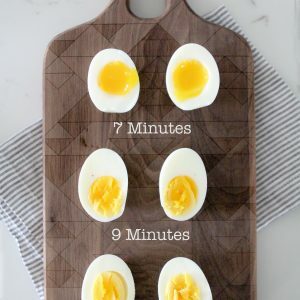 Pour the whisked eggs into the pan and as soon as they begin to set, use a spatula to push them away from the sides of the pan and fold them over, until they’re cooked to your liking. To make the cheese sauce, drain and rinse the cashews. Place the cashews into your blender, along with the remaining “cheese” ingredients. Blend on high for 2 minutes, or until the mixture is completely smooth. 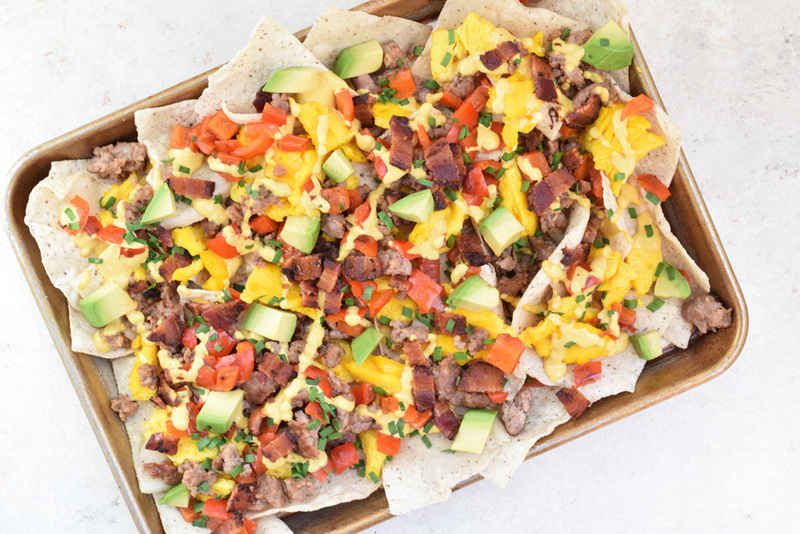 Top the chips with the crumbled bacon, breakfast sausage, bell pepper, scrambled eggs, avocado, chives and drizzle with the “cheese” sauce. ENJOY!